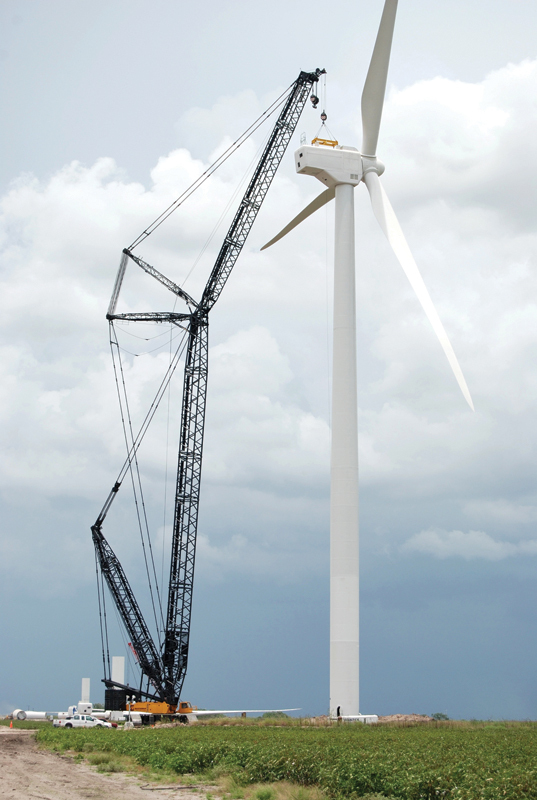 Due to high temperatures, Duke Energy Renewables and contractor Wanzek Construction took a different approach with building the combined 402 MW Los Vientos I and II wind power projects in Texas—they did most of the erection work at night. Anyone passing by the construction sites for the combined 402 MW Los Vientos I and II wind power projects at night last year might have thought they were filming a movie. There were lots of lights and plenty of action—the only thing missing was the movie camera. Faced with very high day-time temperatures in South Texas, the developer of the Los Vientos wind projects, Duke Energy Renewables, and contractor Wanzek Construction opted to do much of the work at night—hence the movie-style lighting. "We started the tower erection around mid-June, and it became apparent very quickly that heat was going to be an issue," said John Polomny, operations manager with Duke Energy Renewables. "We were looking at 120 and 130 degrees inside the towers and the nacelles during the day, with no air circulation." So they looked at options and quickly made the decision to move to night work. "The hot weather was one of the main challenges of the Los Vientos projects, and the guys stepped right up to it, both Wanzek and the OEMs, Siemens and Mitsubishi," says Polomny. About 90 percent of the erection work ended up being done at night. There was a lot of discussion and planning that went into the construction at night, and initially there was a bit of hesitation but with enough lights—and the right kind of lights—it was very do-able. Polomny says it took a week or two to get everything and everyone coordinated, but then it became something of an assembly line process as they got into the groove of erecting the turbines. "The services people that weren't involved in the construction process got very good at moving things around and setting things up during the day, so that when the guys got to the site every night, they turned the lights on and it was just like daylight." At a combined capacity of 402 MW, the two Los Vientos sites were one of the largest wind projects built in the U.S. in 2012. And it is, by far, the largest ever wind project built by Duke, with costs of about $250 million. The company started advance work on the two projects about four years ago, reports Milton Howard, vice-president of wind and solar development for Duke Energy Renewables. There were good signs right from the start on the robust nature of the wind resource, he says. "I remember when I arrived at Harlingen Airport, not too far from the sites. I went to get into the rental car, and the wind nearly knocked the door off, it was blowing so hard. And driving out, the flag flying at the airport was really frayed at the end. As I drove closer to where I thought our project area might be, you could see the trees were bent over from the southeast wind." Also very important is the time of day that strong wind blows. The wind resource on the Texas coast is a fair bit different than the wind resource in West Texas, where there are now literally hundreds of wind turbines. "On the coast, it's an on-peak resource, so it blows when utilities need it and when people use the power, from 8:00 a.m. to 6:00 p.m.," says Howard. The wind in West Texas generally blows at night, an off-peak period. The projects are located near the town of Harlingen, about 20 miles inland from the Gulf of Mexico, 120 miles south of Corpus Christi, and 30 miles north of the border with Mexico. Howard notes that they started out with one site about six miles north of the Harlingen Airport. "We put a met tower in and then found we had aviation issues. They could be solved by moving the site a quarter mile north, which is what we did. "The aviation issue on the original site proved to be kind of a silver lining for us," he explained. "As you go further from the new site, towards the Gulf of Mexico and Lugana Madre (a lagoon that runs along the gulf) there are some environmental constraints. Our final location essentially prevents anyone from building upwind from the projects." Duke leased a total of 33,000 acres of mostly agricultural land from 23 landowners, though they used only 23,000 acres in the end. 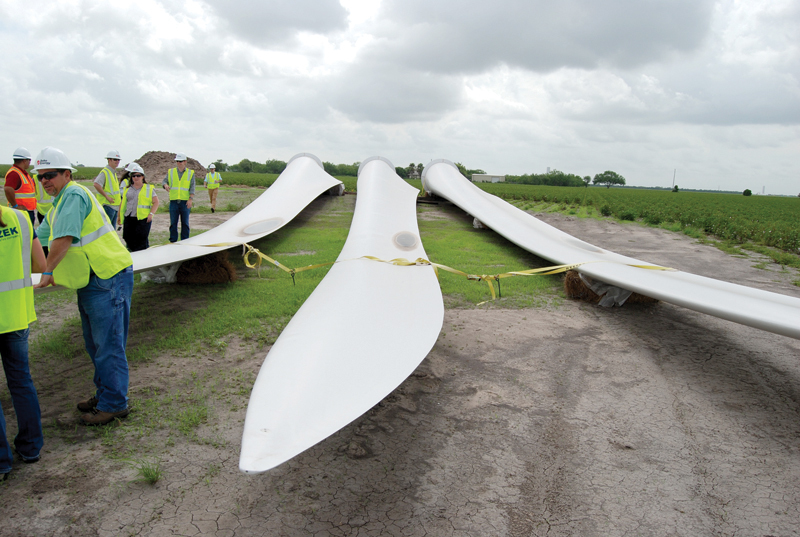 Las Vientos is the fourth wind power project Duke Energy Renewables has done in Texas, so the company knew the ropes in terms of what was required. "The site was basically farmland, so you don't have the habitat issues here that you would have eastward along the coast." That said, they worked with U.S. Fish and Wildlife and the Texas Parks and Wildlife Department and did three years of avian studies. The OEMs on Los Vientos I and II—Mitsubishi and Siemens—were right on schedule in terms of delivering turbines, which were transported by rail, truck, and ship, the latter through the Port of Galveston. The EPC on the project, Wanzek Construction, faced a tight timeline but delivered. The first turbine was erected on June 15, 2012, and construction of the 402 MW facility was completed in December 2012. Since the Los Vientos projects were Duke's largest single wind project, extra resources were required at the company level. "We scaled up staff," said Howard. "It was a big job, and we needed to be done by the end of 2012 because of the tax credit expiring at that time." They started construction in the fall of 2011 with a deadline of December 31, 2012, and the clock was ticking. They were required to deliver power to two different customers by the end of the year. All of the output and associated renewable energy credits from the 200 MW Los Vientos I project in Willacy County is being sold to San Antonio-based CPS Energy under a 25-year agreement. The project has 87 Siemens 2.3 MW turbines. Austin Energy is buying all of the output and associated renewable energy credits from the Los Vientos II project, sited in Willacy and Cameron Counties. It involved 84 Mitsubishi Heavy Industries 2.4 MW turbines. Though there were two separate projects, John Polomny noted, construction ran simultaneously, with extensive sharing of equipment. "It was just considered one big project from a construction point of view," he says. Duke had a fair bit of history with the EPC, Wanzek Construction. "We had built several projects preceding Los Vientos involving the same people from Wanzek and the same people from Duke. So there was a lot of previous experience and a lot of synergy." On a practical day-to-day basis, Polomny noted that every day on the job began with a meeting. "There was a safety/progress meeting run by the Duke construction manager, with representatives from Wanzek, Siemens, and Mitsubishi. We looked at where we were with the construction schedule, what kind of issues we anticipated that day, what was left over from yesterday, your basic SWOT analysis." Concurrent to the senior leadership meeting, there was a daily safety meeting involving all employees. "We talked about the unique things with this project, the heat for example, and the wildlife. There were quite a few snakes out there." It was a challenge managing both human and construction resources, says Polomny, noting the very large work site. "There was so much activity taking place in such a large footprint, we had to bring extra people in from Duke to have adequate coverage of the site." Essentially, 500 construction workers were spread out over thousands of acres. Polomny noted that Wanzek Construction "did an outstanding job," despite being under a lot of pressure. "Wanzek was working several wind projects simultaneously and had to take care of a lot of customers. Everyone in this industry wanted to get their wind projects done by the end of the year because of the expiring tax credit." Wind turbines had to be completed and qualified. In this kind of situation, there is no give and take with the schedule, no flexibility about when wind turbines need to get commissioned, he noted. "You are pushing up against an immovable object, which was that December 31 date. "I'd have to say that this is one of the more challenging projects I've worked on," said Polomny, who has done his share of mega projects, including six power plants and two naval ships. "Other projects, you might have some extra time—we did not have that here. There were a lot of hours put in down there. There was dedication and commitment to doing whatever it took to get the job done." But the push to completion was always done with safety in mind, Polomny said. "At Duke, we always take a leadership role in safety and are never going to compromise safety to get a job done." At a combined capacity of 402 MW, the two Los Vientos sites were one of the largest wind projects built in the U.S. in 2012. And it is, by far, the largest ever wind project built by Duke Energy Renewables, with costs of about $250 million. They had the full support of their parent company, he noted. "Every time we called Duke in Charlotte and said we needed extra resources, we were given those resources. Management was fully in sync with our needs." He noted that senior management had a very good understanding of the project; every month, senior executives held a meeting on the project—literally on the project. "We're not talking about conference calls, we're talking about people getting on planes to come down here and put the hard questions to us about how things were going. They had a full sense of what was going on, and we were able to educate them about our needs, and they were able to see where we were at. It was very helpful to have that when it came to understanding the scale of the project." Milton Howard noted that one of the important decisions made on the project was to bring the operations people (John Polomny and his colleagues) on site early on. "So we had this additional resource of people who could be bolted on to the construction department," said Howard. Polomny, in fact, acted as commissioning manager and some of his operating staff oversaw Quality Control and Quality Assurance, doing the climbs on the towers. 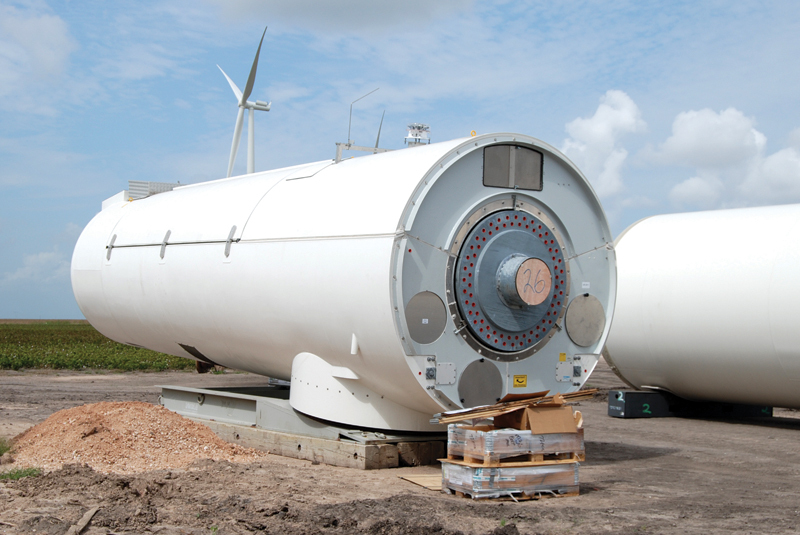 "It was excellent for us because we could see the turbines being built and have that time with the OEMs during the commissioning process and learn even more about the turbines," said Polomny. "It was a win/win situation for everyone. We found ourselves doing kind of fire brigade service, doing work here and there on the project wherever we were needed." Polomny is a big sports fan and has played a number of team sports. He said it was important to have a good team to take on construction of such a large project. "When you have a successful team, it all comes together and it's cohesive, and that's what we saw. At the hard hat level, the guys were out there, building it every day. On every project, you are going to have issues that have to be dealt with. And Wanzek stepped up and took care of us. They understood the challenges we faced, and they accommodated us in every way that they could to get the project done." The electrical subcontractors on the project, Pike Electric, based in North Carolina, and Paradigm Electric Enterprises of Minnesota, also delivered. Polomny said there was some learning with the 2.4 MW Mitsubishi turbines, which Duke had never worked with before. Unlike many other turbine nacelles that are one piece, the Mitsubishi nacelle comes in three pieces. "With most turbines, the nacelle shows up on the back of a truck, and you put it on top of the tower, and you're ready to go. But with the Mitsubishi, we staged the three nacelle components on dunnage, brought in extra cranes to move them and an additional assembly crew. There was additional work, and it's precision work. The bolts are large, but the tolerances are still very close." Polomny said the Mitsubishi Heavy Industries folks were "spot on" in terms of assistance, with six to eight people on site at any one time. Communication was done in English, Japanese, and even a smattering of Spanish, he noted. "It was the same thing—you build a team." The OEMs were right on schedule in terms of delivering turbines, which were transported by rail, truck, and ship, the latter through the Port of Galveston. Pretty much all the turbines were completed by the third week of December with some time to spare. "We got it done. But that meant people working through holidays, Thanksgiving, Christmas Eve. It came down to people doing what they needed to do," says Polomny. "Everyone understood what the requirements were—we needed to have all the turbines commissioned and not have any turbines "orphaned". The answer was always: 'whatever it takes." Along the way, there have been significant benefits for the local community and more to come. Duke Renewables estimates it will spend some $200 million locally over the life of the contracts of the two wind projects. Willacy County, the main county where the Los Vientos facilities are located, now has a new Boys and Girls club, courtesy of the project. The town of Lyford, in Willacy Country, was laying off teachers in their school system and could not purchase enough textbooks. Its school buses were breaking down. Working with the county and the tax revenues from the wind projects, they were able to tap into a state development program that delivered more funding per student. "They'll have new facilities, school buses, and textbooks, and maybe even I-Pads," says Howard. "It's had a tremendous impact on the community." There are more Los Vientos projects to come for Duke Energy in South Texas. In June, Austin City Council approved three new wind contracts totaling 570 megawatts. This will bring Austin Energy's total wind portfolio to 1,225 MW and puts the utility four years ahead of schedule for meeting its 35 percent renewable energy resources goal by 2020. Of the three contracts, two are with Duke Energy Renewables, each for 200 MW. Austin Energy will buy power generated from the Los Vientos III and IV projects in Rio Grande Valley's Starr County, about 30 miles northwest of McAllen. The Los Vientos III wind project is expected to be online at the end of 2014, and Los Vientos IV is expected to be complete by mid-2016.